PKN's March-April 2018 front cover for Currie Group is an industry-first media execution, showcasing leading-edge printing technologies for packaging, augmented reality activation, security coding and a creative social media campaign in support of The Australian Rhino Project. PKN's latest front cover, which comes in 4500 unique variations, is the launching platform for a collaborative creative project led by Currie Group to demonstrate new print technology and support a worthy cause. The front cover of the latest issue of PKN is not only a showcase of high end printing, finishing, coding, marking and AR technology, it’s a demonstration of industry collaboration at its finest resulting in an innovative marketing campaign that extends beyond business concerns to benefit a cause of global significance. 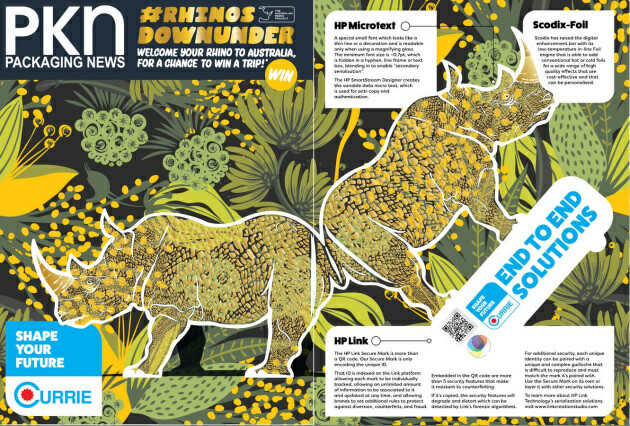 The bright idea for the #rhinosdownunder project was sparked when Currie Group Labels and Packaging director ANZ, Mark Daws, and marketing manager Matt Tangey decided they wanted to break the ‘category code’ for advertising machinery and raise the bar in reader engagement by delivering something truly unique on every cover, while still getting Currie Group’s message across regarding its capability in packaging. “Initially we discussed the idea of a folding carton embedded in the cover, but real estate was the concern. We also wanted to engage a charity so that the [removable] item could be used as part of the campaign,” Daws explains. 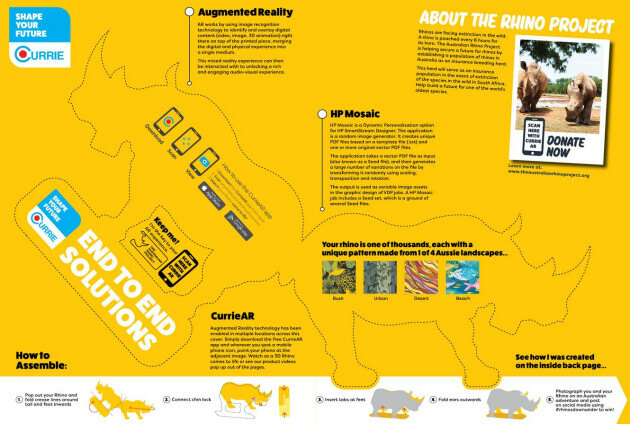 “And this is where our interpretation of the project started taking shape – the concept of a rhino that could be removed and constructed by the reader, that was unique in its appearance and could be used in a social media campaign that would drive engagement and highlight this worthy cause. “We really wanted to push both the philanthropic message as far as we could, beyond the PKN audience, while promoting capabilities and technologies as sold and supported by Currie Group,” Daws says. CREDITS: The rhino design and artwork was conceived and executed by Melbourne design agency Birdstone Collective. The cover was printed and finished with equipment and solutions from Currie Group (including the HP Indigo 30000 Digital Press, Scodix Ultra Pro with Foil Station; Kama ProCut 76 Foil finishing die cutter) and with foil supplied by Kurz. Each rhino sports security coding by HP Link and HP Microtext. The augmented reality dimension of the campaign was delivered by DreemAR through the CurrieAR app. The PKN team and Yaffa Media is proud to have been part of this groundbreaking project. A special thanks to our printer Bluestar for the excellent care taken to ensure the covers were protected right through the high-speed binding process to deliver a high quality end product in our readers' hands.